Over the past days, a few times, ‘assisted’ by swallowing a drink in some strange way, Pádraig managed to say ‘O’s, ‘ A’s, and ‘I’s once, twice or three times when asked. We have been hoping for his voice to come back and there have been signs that this will happen. Being able to say, in certain situations, these vowels a certain number of times is not a miracle, just another sign that this will eventually happen. Have a look at the following list and try to spot the odd one out. 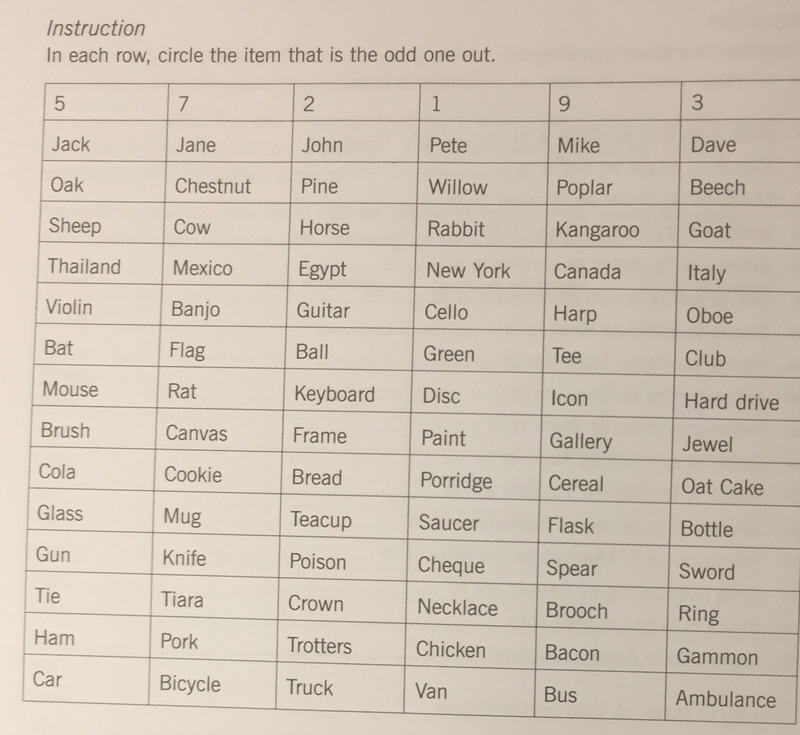 The list is from a brain injury workbook. It’s not that difficult to do, but it’s also not that easy either, I think. How did you do? Did you have to think about in some lines which one was the odd one out or were they all immediately obvious? I did not even know all the words and had to ask what a ‘poplar’ was and what was meant by ‘trotters’. Pádraig got them all right. And he loved it. Whether it was easy of difficult, this kind of ‘game’ is, most certainly, exercising the brain. And that is, science and experience tells us, as important as exercising the rest of our bodies. Half an hour a day. Minimum!